contests indiblogger Wechat - Connecting Lives! Disclaimer - Strictly fictional! The images have been created by me. I was busy absorbed in the Java Migration project planning activities. It sent shivers down my spine when I learned that I was made the SPOC for the crucial migration project. I was involved in a 2 hour project discussion with my boss. During my discussion, I received several phone calls. Soon I placed my phone into silent mode and spoke about the estimation related stuffs to my boss. The cell phone didn't stop buzzing. My boss gave me an ugly look when my fingers fidgeted with my cell phone during an important discussion. "Anoushka! Damn it...wait for some time!" I said to myself. By the time I left his cabin, I saw 18 missed calls and 2 texts. 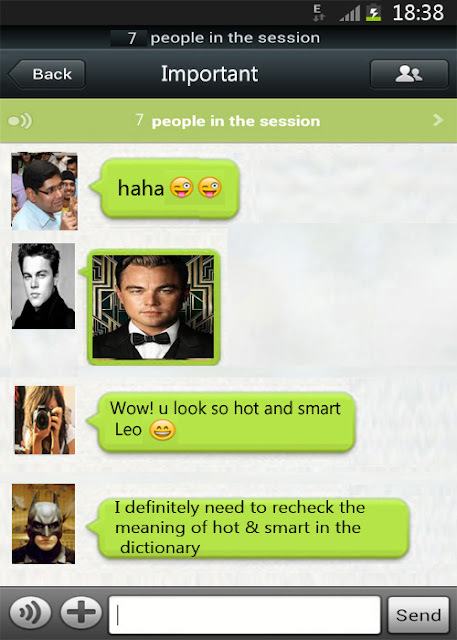 "Stupid Insaan, check your WeChat right now..." I read her text message. I quickly rushed to my cubicle and checked my WeChat and saw 1 voice message. "You are not the same anymore.I see you have no time for me and I am highly disappointed with your behaviour and attitude towards me. I always used to think that you are the only person in my life who could bring smile on my face and that’s why I love you. You know I am so loyal to you and how much I love you. You can't even pick a phone call Na." I heard her voice message on WeChat. I could feel that she was crying. "Anoushka, don't cry...are you angry on me or what...” I quickly send her a voice message. "Yes I am angry. All these days I had been losing my heart, mind and everything to you and you just don't care. I am leaving you once and forever...Good bye!" she replied to my voice message. "Go die...Enjoy and Flirt with random girls like you always do!" Her voice clearly indicated me that she was vexed at me. "Hey sorry! I seriously was involved in a discussion with my boss. 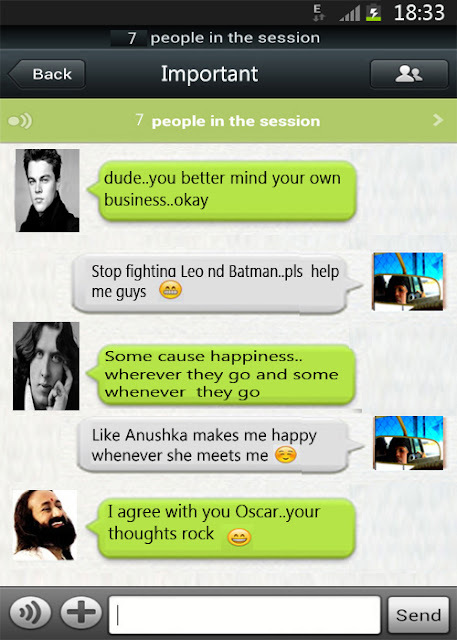 Please talk Anoushka!" I send her another voice message on WeChat. I tried calling her, texting her and even left voice messages on WeChat, but all my attempts to reach her seemed futile. Later that night, I contemplated for about 10 minutes on issues which encircled my life. Anoushka was special for me and it was love at first sight for me. Such was her magic. She cast a spell upon me the moment our eyes met for the first time. I couldn't dare to lose her. I had been ignoring her feelings lately because of my office work. I remember we used to go out every day and saunter at Marine drive - enjoying the scenic beauty of the magnificent evening sea. Our bond grew stronger but eventually things got messed up. Anoushka was a short tempered girl and I realized that I would have to do something extra ordinary to save our relationship. I knew many things about her that others don’t know. She loved Leonardo Caprio more than me. She was a diehard fan of Batman. Sri Sri Ravishankar was her inspiration and Oscar Wilde was her favourite writer. By hook and crook, I gathered their contact details in WeChat and spoke to each one of them through the WeChat chat features. I urged them to talk to my girlfriend Anoushka who was mad at me. I wanted them to talk to her and let her mind seek inner peace. Of course, they would talk good things about me too. At first, Leonardo hesitated as he was having conflicts with his shooting dates but later on he acquiesced to my request. Sri, Batman, Oscar Wilde immediately agreed as they believed that this could benefit me. 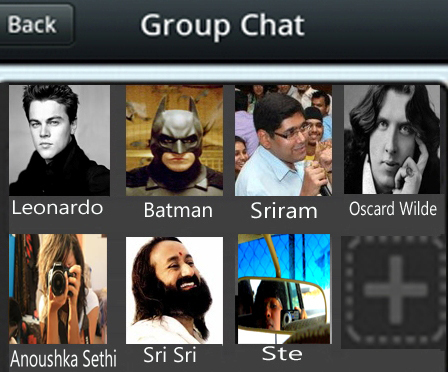 At the same time, my close friend Sriram pinged me on WeChat. Sriram - What are you doing bro? Me - Gearing up for a group chat with Leonardo, Batman, Oscar Wilde, Gurudev Sri Sri and Anoushka. Sriram - So all famous celebs sans Anoushka under one roof ;) Get me in man. Me - Get you in for what? No ways. Me - Okay! But under one condition that you won't mess things for me. Sriram - Okay I won't but what is the agenda for the meet? Me - Anoushka is mad at me and left me << Sad Face Smiley>> and this group chat is to get her back. 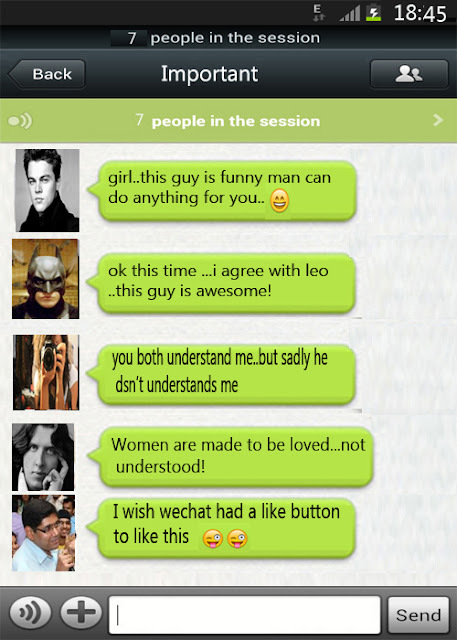 I soon added everyone in a group chat in WeChat application including Anoushka Sethi - the love of my life! And this was how I got my girlfriend Anoushka back . Awesome ... this one rocked ... just too good !!! wow so cool and the images are awesome! I am glad you like it Ankit! All I did was pour oil into the fire :D.
A lot of hard work has gone into the making of this. Neatly done.